You can tell if it's a Visa or MasterCard based on the number it starts with, i.e. 4 for Visa, 5 for MasterCard. Why do most billing forms request the type of card? It's not a barrier for bots (to my knowledge). It's an additional button to click for someone about to pay for something. "Wait, why wasn't I asked what type of card I had? Everyone always asks that! Something's fishy here." Why not just show them "Visa" (or whatever card symbol that they have) as they start typing? The simple answer is that 10-20 years ago, no one knew any better and it sort of just became the convention. A slightly more complex answer indirectly deals with PCI (Payment Card Industry) compliance. If you want to accept credit cards online, you have to have an IMA (Internet Merchant Account). You may obtain your IMA through a bank or PSP (Payment Service Provider). For the sake of this scenario, we will assume you are not PCI compliant and elect to go through a PSP to obtain your IMA and to process credit card transactions. At that point, you are at the mercy of whatever PSP you choose to go with. If their credit card form asks for the card type, then by proxy you are asking for the card type. Obviously, you decide what PSP you want to use, so you can find one whose credit card form has the functionality you want. The good news is that the convention is changing to more of a user experience convention. 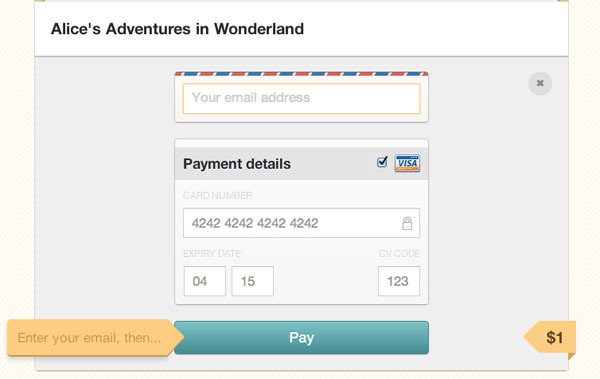 Designmodo has a great article called The Ultimate UX Design of: the Credit Card Payment Form. Do you have to display credit card logos? The reason sites put the logos up and ask the user to select is because VISA, MC and others either require it or give slightly better rates when you do. Period. The bit about displaying logos is part of the scheme rules (requirements of which are typically passed on to merchants by their acquirer); MasterCard’s website mentions that it’s compulsory. I’m not sure where VISA and AMEX mention it (or whether they mention it) on their websites. Display the Acceptance Mark at parity with all other acceptance marks/symbols/logos also displayed (with the exception of MasterCard POI locations in the U.S., where a specific regional Standard that permits otherwise exists. Refer to MasterCard Rules, Rule 5.11.1 "Discrimination" of Chapter 15, "U.S. Region Rules"). This is sort of confusingly worded. Due to the use of the word parity in that statement, it seems to me that you only have to show their logo if you show other logos, as parity means equivalent to, or a state of equality. I could be wrong though, it doesn't seem to be very clear. At internet merchant locations, cardholders must be able to determine immediately that the particular brand is accepted. The most effective way to ensure this is to display the appropriate Acceptance Marks on the merchant's home page. At the very least, the appropriate Acceptance Marks always must be displayed where payment options are presented. So here, the last sentence MasterCard states that Acceptance Marks always must be displayed where payment options are presented. However, they don't tell you what happens if you don't. In conclusion, it seems that you should display credit card logos, but I'm not sure if it's an actionable offense if you don't. If anyone has a source that clarifies whether or not it is, I'd love to know and update this section. How can I automatically detect the credit card type so I don't have to ask for it in the form? Now, as you should have noted from the info graphic, we are able to determine the type of a credit card by looking up the first 6 digits of the card number. These first 6 digits make up what is called the credit card's IIN (Issuer Identification Number) or BIN (Bank Identification Number). Make your own database comprised from the known IINs listed on Wikipedia for you to query. This list is pretty much outdated, however. a. You only get a limited amount of free lookups and then you have to purchase a license. Go through ISO by purchasing ISO/IEC 7812-1:2006 and/or ISO/IEC 7812-2:2007.
a. ISO/IEC 7812-1:2006 specifies a numbering system for the identification of issuers of cards that require an issuer identification number to operate in international, inter-industry and/or intra-industry interchange. b. ISO/IEC 7812-2:2007 is one of a series of International Standards describing the parameters for identification cards, and the use of such cards for international and/or inter-industry interchange. It describes the application and registration procedures for numbers issued in accordance with ISO/IEC 7812-1. This is also a way to let the user know which cards are supported by the merchant. If you only see Visa and Mastercard options available, you won't pull out your Amex and punch all the numbers in just to have the site tell you they don't accept Amex. Many sites do not accept Amex or Discover because of the extra fees they charge for processing. Users with Amex cards will usually check the list first preferring to use their Amex, but if it's not listed they will (begrudgingly, in my experience) fall back to their Visa or MC. It probably is possible to design a system that figures that out on its own but it isn't great systems design to set it up that way. Different cards have different numbers of digits and it is best to explicitly state how the system should parse the values and number of digits it should expect. In the case of an error, it makes error handling easier as well. If the consumer says it is an American Express card yet enters more than 15 digits, you can check against the first digits of the card to cross-check the type of card and, if that matches, give an error that extra digits were entered. Without that cross-check, the source of the error may be harder to figure out. Also, it simply a way to verify the credit card. It's a check. It's also very helpful for the consumer. If he intends to pay with his Visa and he grabs his wallet and starts type 5455... he may then say "Whoa I didn't want the MasterCard." The number of digits really isn't an issue. The first set of numbers determine the type of card so they don't need all the numbers. My answer won't be voted up but you need this one if people from China is in your customer base, which is roughly 20% of earth's population. Most online transactions in China are though 'UnionPay' system in a certain stage, and most of them are not MasterCards, none are VISA cards (due to some nasty competition issue between UNIONPAY and VISA). It is a monopoly, but that's a fact of life. Many users do not know that they need a MASTERCARD or VISA in order to pay outside of China, and those who do, do not know whether your website is outside of China. So in the world's largest e-commerce market, billions of users are paying online with a card that has only UnionPay logo, unfit for most international online transactions, everyday. When they visit your website, which may be even in Chinese but doesn't process payment in China (and not through UnionPay), having to choose VISA/MASTERCARD effectively turn the problem "Your website doesn't process my payment" to "Your website doesn't support my card", which gives the user a clue to seek a solution on his own (let's find a card that is supported by this site) instead of sitting there frustrated. The same may even be true in other countries int the second / third world, that most of the bank cards floating around being used for payment everyday are not one of MASTERCARD/VISA. You can argue that you let them type the card number. If it is neither MASTERCARD nor VISA, nor anyone your system supports, you can display a message saying "We only support this, this and this, and your card is not one of them". If you added this in your question, I wouldn't need to post this answer. On a side note, equipped with billion-numbered users, UnionPay wish to be accepted as an international payment method, direct in competition with MASTERCARD, VISA and American Express. I hope they are not so easily accepted, because that would be a wrong lesson, that "You can win the world with China's government-lead monopoly business". The last time I paid an invoice with PayPal it automatically detected the type of card I was entering. I was a bit surprised to not have to enter my card type but I was reassured after seeing the correct card type highlighted. From my perspective it is nice to have the card type automatically detected but I can see how it might be more complex to implement. For the majority of projects I'm involved in, implementing this would fall under the "will it make us more money?" objection and likely wouldn't be a priority. Your situation may be different and I would welcome this as a standard practice. The fact that your credit card has been issued by Mastercard, Visa or American Express is not necessarily related to the method of payment. While this is true for chip-less cards, it is not for cards which embeds a chip. The Europay Mastercard Visa (EMV) standard specifies how the chip should behave, and one of the features of these chip is to support multiple applications. Each application is tied to a specific method of payment and depends on your credit card issuer and your bank . The form asking you to select between Mastercard, Visa, etc. does not asks you for the card issuer, which can indeed be deduced from the card number, but for the method of payment, even offline. With chip cards this is (generally) automatically selected by the physical payment terminal, depending on the card and the terminal capabilities. For example, when I use my card in France, it use the "CB (Carte Bleue)" application, common to all (or most) card issued in France, but if I use my card in the USA it will use the Mastercard application which is understood by both my card and the payment terminal. The application ID is printed on the ticket. Offline, there is no mean to know the list of applications supported by your card which tells how the payment system should behave, so it needs to asks you. Most people will use the card issuer's method whose logo is printed on the card (Mastercard, Visa, etc. ), but other methods could be available. It is really frequent in multiple countries to have a payment method different from the card issuer's one, even if both could work to fulfill your payment (see Zhang Weiwu's answer related to China). Depending on the payment method you choose, the payment system will have an according behavior (e.g. two-step authentication, ...). Many early e-commerce systems were fairly unsophisticated and were just text boxes that passed payment data along, so they had to record the card type to pass along to the payment processing system. I think that has just become a standard that has stuck. Payment processing systems need to know what type a card is so that they can pass it on to the relevant payment system (Visa, Mastercard or AMEX, or in some cases a country-specific system like Switch or EMV). Unfortunately, it is quite difficult to determine from the card number exactly which type of card you have been presented with; there is a database of “IIN numbers”, which form the first part of the card number, but it is not easy to get hold of. FWIW, all card numbers starting with the digit “4” belong to the VISA system. Card numbers starting “34” or “37” belong to American Express. The other card schemes are trickier and tend to be rather fragmented (in particular, Maestro is part of the Mastercard system, but for historical reasons there are Maestro-branded cards dotted all around the number space; as a result, it’s probably best to regard cards as Mastercard unless they belong to a range you know isn’t Mastercard’s). See Wikipedia’s list of IINs for more information. It sends a signal on which payment methods you're accepting. Arguably, it could be equally well-accomplished by displaying the logos, but this way the customer who tends to ignore any extra information and immediately proceeds to fill in the numbers won't be told "Sorry, we don't accept Discover round here" after they've gone through the whole process of pulling the card out and entering the numbers in. Many of the answers I've seen have been very enlightening but I want to throw another angle based on my own experience. Many forms which are prevented to the user to collect money need to be signed off by banks and financial institutions involved. These often have very strict guidelines surrounding layout and format of the fields. Any deviation from this layout will prevent them from endorsing (or sometimes accepting payments) from your application. As such a standard template is often kept. For many sites it might be lazyness/cargo culting. But for many the real answer is so they can charge credit card fees. We can't tell the difference between a Visa credit card or a a Visa debit card (same for all brands) based on the card number itself, so we have to rely on the users telling us. As ever, follow the money. Not the answer you're looking for? Browse other questions tagged forms billing credit-cards or ask your own question. Why do address forms ask for the US state? Is it a bad idea to have all credit card fields on one horizontal line? Why do so many credit card forms ask for the expiry date using select boxes? What should the default value be for a credit card expiration date? Why do sites tend to ask members for payment details, even if what they're accessing is 100% free?